The breast is the most important external sign of a woman's femininity. Having a full and pert breast symbolizes youthfulness and womanliness. This explains why breast enlargement is the commonest cosmetic surgical procedure in the UK as wellas the rest of the World. 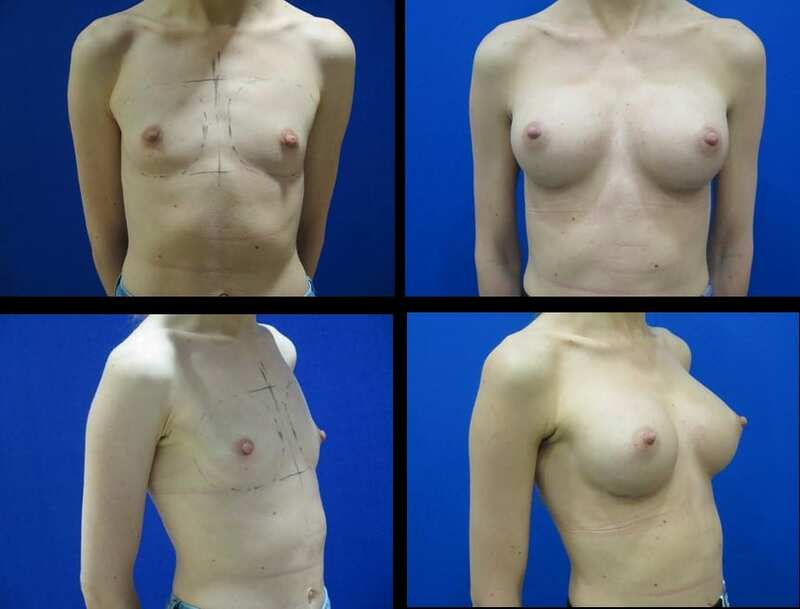 When considering breast enlargement, it is important to choose a surgeon who can assess your individual build, requirements and personal desires. Based on these parameters and an artistic eye, the surgeon should then be able to advise you on the specific shape and size of implant to suit you. Since 2010, CC Kat has started using the polyurethane coated implants from both the Brazillian Silimed as well the German Polytech company. There is increasing evidence of reduced capsular contracture and implant rotation rates with these implants. The comprehensive range of implant shapes also means that an implant can be chosen to fit a patient optimally. The 3 implant companies offer an automatic enrolment into the implant lifetime warranty against rupture. Mrs Kat offers a free follow-up at 3 months and up to a year post-surgery. Additional information about the implants can be found through these links. Mrs Kat has never used the PIP implants either in cosmetic or reconstructive surgery. These French implants ( but also distributed under different names in various European and Asian countries) were found to have a non-medical grade silicone gel not meant for placement in the human body. They also had a proven higher rupture rate. These cheap implants were used largely by the cosmetic clinic chains and various clinics around the world that attracted cosmetic tourism. Read Mrs Kat's blogs that covered the out break of news about these implants over a year's period from 2010. Mrs Kat very infrequently uses a drain which will be removed the morning after the surgery. The sports bra is worn over the dressings and to be worn day and night for the first 2 weeks and during the daytime only for the next 3 months. Gentle shower is allowed and pat dressings dry. Appointment approximately 1 week after surgery when the tape under the breasts is removed and re-taped. Wound is allowed to get wet after this. Bathing from 3rd week onwards. First week – minimal upper body activities. 2-6 weeks normal daily activities including driving but no excessive stretching of arms. 6 weeks onwards – all activities. Micropore tape to the scars - once well healed – for at least three months. The micropore tape is to stay on for showering and baths and simply patted dry and not to be changed until it is very loose and almost falling off by itself. Frequent removal of the micropore tape can irritate the scar. Moisturising the surrounding breast skin. Sports bra to be worn during the day for the first 3 months. Normal bra and bikini can be worn for holidays and the odd special occasion for the first 3 months. No underwired bra for the first 3 months. "During my youth I was always obese. Whilst my childhood years were good, I tried really hard to lose weight but nothing worked. When I was 19 I was diagnosed with an under active thyroid..."
"I first decided to have a breast augmentation around a year ago and did alot of research online. I had some initial consultations with a number of highly recommended plastic surgeons in the UK..."
"I found the whole process from start to finish to be delightful and didnt feel apprehensive as everything was explained to me all through the process.CC KAT has given me..."